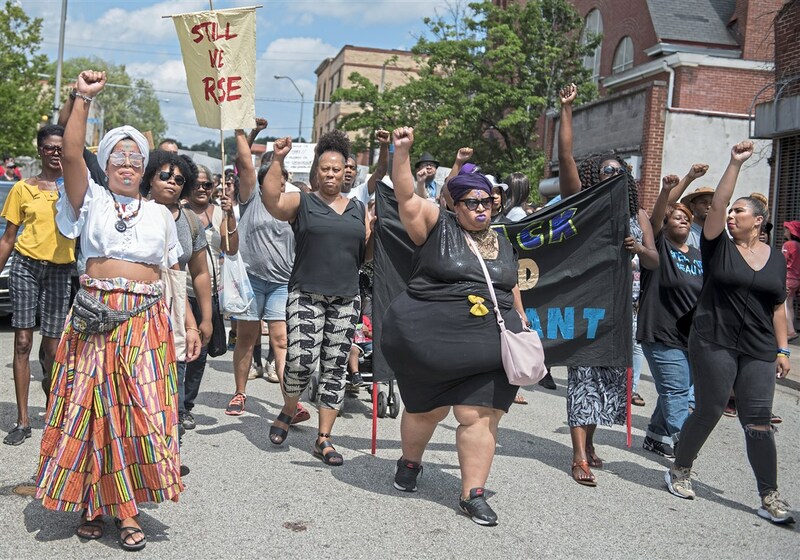 An aborted attempt to organize an alt-right protest in Larimer on Saturday instead gave birth to a peaceful and prideful march for the city’s black community. The march was just one of several community-supportive efforts in the East End. More than 300 marchers carrying hand-made signs — accompanied by a team of 10 Pittsburgh police officers on motorcycles — filed from Homewood to North Point Breeze, chanting “black lives matter” and other slogans in a show of solidarity. The march, which began about 1:20 p.m. on North Homewood Avenue, was prompted by last week’s violent confrontation between ultra-conservative groups and minorities in Charlottesville, Va., and — more importantly — an internet-based suggestion of a right-wing rally outside local Google headquarters. The alt-right Google protests in Pittsburgh’s Bakery Square and eight other cities across the country were originally planned in response to the search-engine company’s firing of an engineer for an internal memo arguing that biology could contribute to the under-representation of women in high-tech jobs. The Google marches were postponed soon after they were proposed. A handful of supporters turned out Saturday and were met by counter-protesters, but the small groups soon dispersed. “The Peaceful March on Google has been postponed due to credible Alt-Left terrorist threats for the safety of our citizen participants,” organizer Jack Posobiec wrote on the event’s website. The city, however, was not taking chances and took steps to ensure order in the East End. Mayor Bill Peduto spent part of Saturday in a Police Command Center set up there to monitor all the events going on. He also attended a community outreach at the Pittsburgh Theological Seminary in East Liberty where dozens met to foster community initiatives alongside the police and local activist groups. The Youth and Families Community Summit — sponsored by the Black Political Empowerment Project, the Pittsburgh Bureau of Police and other groups — brought police and civilians together in classroom settings where they discussed direct actions for their under-served communities. They left with a single message: to implement, mobilize and realize a better relationship between youth, families and the police. The summit, which lasted five hours, took place only blocks from the “Black Brilliance Collective: March and Gathering,” where the message was of encouragement and empowerment. “These are people that have been looking for help and resources, and nobody comes to them and asks what they need. They are ignored,” said march organizer Brittani Murray of Lincoln-Lemington. “But then these people say they’re coming to Bakery Square, a predominantly black neighborhood, and all of a sudden the media attention is in full swing. Ms. Murray said it took less than 72 hours to organize the march. Marching behind a “Black is brilliant” banner, people of color led the way, with other supporting groups marching behind them, to Westinghouse Park — also known as Malcolm X Park — in North Point Breeze. Dozens of other police, some on horseback, monitored the procession and a Pittsburgh Public Works dump truck followed the marchers to prevent any motorist from driving into the crowd, as happened in Charlottesville. All along the route, the marchers roused supportive cheers from residents who came out to their front porches. “These are our streets, and this is our world. And we aren’t going anywhere,” said one of the organizers as the marchers paused at McPherson Boulevard for a moment of silence to remember community members who have been killed. Once the rally reached the park, organizers advised the news media to leave. The event then continued for several hours with food, music and a poetry reading by local activist Medina Jackson. The community’s relationship with the police was a crucial point in the Youth and Families Community Summit going on at the same time, where Zone 5 Cmdr. Jason Lando led groups through exercises designed at thwarting implicit bias and ensuring procedural justice. It was a plea for understanding, putting the community in the police officer’s shoes. While other workshops focused on community-building ideas, the talk on bias steered toward dealing with the police. “Comply first, complain later,” Cmdr. Lando said. Often, though, a strained relationship between parents and the police, said Angela Tookes of Early Head Start, can lead to roadblocks in addressing traumatic events. For her, trauma can be a community’s path to destruction, if not dealt with appropriately. In empowering youth with a strong sense of self, Ms. Tookes hopes the trauma that drugs, gang violence and anxiety toward police bring into African-American communities can slowly dissipate. At the youth violence prevention workshop the goal was identifying social issues “as systemic issues.” Only in that way, said Valerie Dixon, of Prevent Another Crime Today, can youth begin to organize and “wake [their] behinds up” to the danger posed by isolation from a community. She added that people are constantly finding ways to separate themselves from one another. That needs to change, she said. In coming up with solutions, the general consensus was one of direct volunteer action; “making it personal,” as Ms. Dixon put it. She, along with Richard Carrington, executive director of Voices Against Violence, demanded that the youth present lead by example. Mr. Carrington called for safe places that young people can go to, and for better communication with the police. Thirty-three-year-old Matthew Salik, of McKeesport, asked for support in creating peace crews intended to defuse situations creeping toward violence and confrontation. He also called for a strategy of community triage, where groups can direct resources on a neighborhood’s specific needs. For that, he said, there needs to be more efficient organization between Pittsburgh’s advocacy groups. Meanwhile, an organization called One Love Unity held a daylong event in a lot at the corner of North Homewood Avenue and Frankstown Avenue aimed at bringing the community together through Christianity. The event, co-sponsored by Mad Dads and ActsMen, was a cookout with free food and drinks with a small stage set up for speakers who gave testimonies of their faith and its impact on their lives.